Andy Murray will head to Wimbledon having lost all three of his preparation matches after he was beaten by Novak Djokovic in the Boodles exhibition event at Stoke Park. In his last outing before SW19 - and world number one Djokovic's only warm-up - Murray went down 6-4 6-4 at the Buckinghamshire venue. The Scot also saw his Queen's title-defence end with a first-round defeat by Nicolas Mahut last week, and fell to Janko Tipsarevic at Stoke Park on Wednesday. 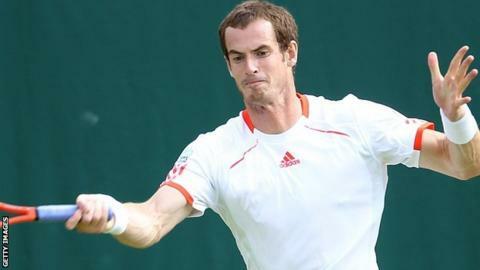 Murray learns his Wimbledon first-round opponent when the draw is made at 10:00 BST on Friday. "It was a decent match," Murray said of the Djokovic match. "It had been raining fairly heavily before we went out but both of us wanted to try to play. "After the initial five or six games there were a few good points. "I think my preparations have gone very well. Queen's was obviously disappointing, but here the results weren't important at all. "I'd have liked to have done better at Queen's, but after that I had a couple of good practice matches over at Wimbledon and had a couple of matches here as well. It's been good." He will not be unduly concerned by the results at Boodles, but his build-up to the season's third Grand Slam has been far from ideal. Murray admitted his movement was poor in the loss to Mahut and he was edged out by Tipsarevic despite an improved performance. Djokovic presented opposition of the very highest quality and the Serbian - who holds the Australian Open, Wimbledon and US Open titles - looks in prime condition. After a rain shower delayed the start of play and Murray emerged wearing his hitting partner Dani Vallverdu's top in the absence of a match shirt, Djokovic broke serve to love in game one. The match was stopped for a short period after game seven to let it dry out, during which time a member of the ground staff attempted to dry the baseline with a hand-held blower as Djokovic jokingly wiped the turf with a towel. After the re-start, Djokovic served out the opening set to love and struck in game five of the second with a stunning crosscourt backhand return. Neither player was operating at full intensity - occasionally acting up for the crowd - and although Murray levelled at 4-4 with a fine off-forehand, Djokovic immediately broke to love and quickly wrapped up victory.